PSA: There are some minor spoilers contained throughout this review, but nothing major. I played the Wii U version of the game and plan to continue playing for quite awhile. After numerous delays and then a new system announcement, I had a lot of worries regarding The Legend of Zelda: Breath of the Wild. Even when it was announced, I was concerned that Nintendo was "selling out" to the ever louder demands that games be truly open world and "sandboxy." I didn't want to play, The Legend of Zelda: Skyrim Sword. The Elder Scrolls received much devotion from me, but Zelda has always kept a cherished place in my heart that was uniquely Zelda's to own. 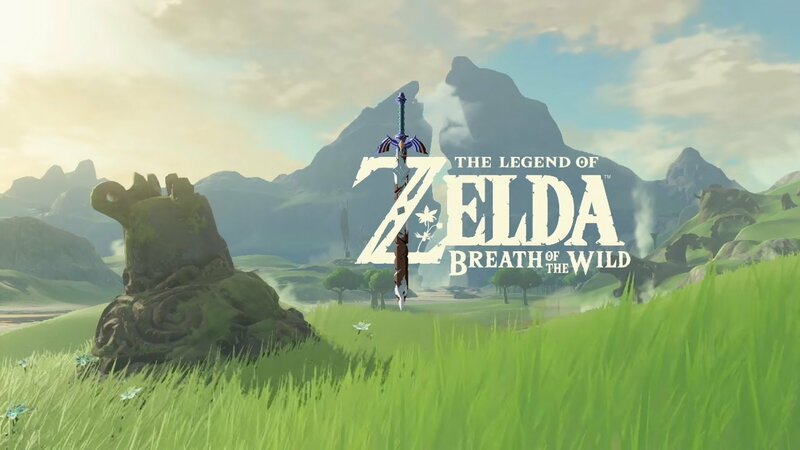 The initial reviews have placed this game with the best reviews ever for any game, and I think that the latest entry to the Zelda series deserves every one of these reviews. It is a truly magnificent game, yet as IGN even states that 10/10 games aren't perfect, despite calling them masterpieces. "Simply put: this is our highest recommendation. There’s no such thing as a truly perfect game, but those that earn a Masterpiece label from IGN come as close as we could reasonably hope for. These are classics in the making that we hope and expect will influence game design for years to come, as other developers learn from their shining examples. Examples: Metal Gear Solid V: The Phantom Pain, [Redacted] (aka: Joe and Lilly's Excellent Survival Adventure), The Legend of Zelda: Ocarina of Time, [Redacted] (aka: Fifth Installment of Game Series Where You Deserve Many Life Sentences for the Atrocious Crimes You Commit in the Name of Fun)." Each of these games isn't perfect as IGN states, but they alter the landscape and create new milestones for future games to achieve. The Legend of Zelda: Breath of the Wild (TLoZ: BotW) is such a game. It departs from many of the tired Zelda tropes that have originated since the days of The Legends of Zelda: Ocarina of Time and A Link to the Past and brings a new flavor all its own. Previous games would guide you to a new area, with open world enemies that would culminate in the discovery and opening of a dungeon. In each dungeon, you would find a map, compass, new item and a big key. The new item would be the solution to most of the dungeon's puzzles and the dungeon boss' vulnerability. That has been the pattern for the better part of 25 years. To continue comparisons to previous entries, I think it is safe to say that this game shares the most DNA with the original, The Legend of Zelda, that hearkens all the way back from 1986. To say that this game feels modern, yet most similar to the original is a bit of a shock. Nintendo made this happen though and it feels intentional. The game is brutal in some respects with regard to difficulty and it doesn't really give you a ton of direction as to where you should go. The hardest open-world enemy from the original, called a Lynel, makes it's 3D Zelda debut here and they plague you in this game as much, if not more so, as they did in the early 2D entries in the series. I still haven't successfully defeated one. Another similarity between this game and the early Zeldas is that it spikes in difficulty depending on the area you visit, meaning that you can approach a Lizalfos in the Lanayru region and it will utterly destroy you in a single swing if you're still in a fledgling state. Nods to previous Zelda games appear in BotW in such a way that causes the series to truly feel like a multiple eon-long history. Certain statues that appeared in Skyward Sword, chronologically the earliest entry in the Zelda franchise, dot the land. Mentions of multiple iterations of Ganon, including that he once manifested himself as a Gerudo show ties to Ocarina of Time. During a certain early clip where Link is dubbed a knight, a line recited by Princess Zelda says, ". . .whether Skyward bound, adrift in Time or steeped in the Glowing Embers of Twilight. . . ," squarely acknowledging Skyward Sword, Ocarina of Time and Twilight Princess as part of this overarching Legend. The only question I have is whether the events of Wind Waker have happened yet. However, the presence of one particular race and the playing of a particular song from Wind Waker in their town suggests that this might be the latest chronological entry in the series yet. However, once upon a time, the producer of Wind Waker said that this feathered tribe was an evolution of the Zora, so the fact they both exist in the game just might mean Nintendo doesn't worry much about continuity in the Zeldaverse, or that it occurs before Wind Waker. As the Switch has been touted as holding all previous consoles DNA, I think Breath of the Wild shares some DNA with each entry in the console series and even some of the handheld. The fighting style including shield placement and parries, first occurred in The Adventure of Link. The evolution of puzzle design, such as lighting of torches and pressure pads first occurred in A Link to the Past, along with wands of varying elements. Ocarina of Time introduced the Gerudo, Gorons and Zora in their modern form and they are present in this game. Majora's Mask had elements of precise timing that haven't been matched since, and clothing was very important in that game, and Triforce Heroes as well, as it is in BotW. We've covered some nods to Wind Waker, Twilight Princess and Skyward Sword, and to analyze more would be leaning a bit more into spoiler territory than I am comfortable delving. Gameplay-wise, the quest structure from A Link to the Past, to Skyward Sword, where the rigid sequential pattern of overworld exploration, followed by dungeon delving and boss defeating hasn't changed much until A Link Between Worlds. In that entry, each item in the game was mercifully rentable for a nominal fee, but if you died, the items would be forfeited. It provided a new flexibility that hadn't been felt since the original Legend of Zelda, but even that game numbered the dungeons. In A Link Between Worlds I conquered a number of dungeons, "out of order," and this new pattern, or lack thereof in BotW, is welcome for the most part. The only places that suffer a little bit are a couple boss battles, which feel a little more "hack 'n slash" than Zelda should be. Fortunately, the rest of the game benefits from this and BotW is truly an open world. After you finish the initial training area, you are free to go wherever you like. I am sure you can follow each of the main quests that are clearly marked for you, but I doubt few will take such a direct route in this game. Never before in a game have I felt such freedom to conquer battles and puzzles in many different ways and in almost any order I desired. Let me share an experience I had early on in the game. Up to this point in the game, I liked the BotW, but I didn't love it. I had three hearts to my name, so I had to be careful. In my newly revived amnesiac state, I ran into a camp of enemies. They had the high ground. They had sentries and guard towers that were manned (bokoblinned?) with archers. Taking a guns blazin' approach would result in multiple deaths and ultimately, failure. I wanted the promised treasure that would be mine if I could clear the camp. How would I go about this? If it were an FPS, I could snipe the camp from a distance, but this is Zelda so I had limited options being about two-hours-old in the game. I examined the area and noticed a nearby campfire. I also knew that I had a wooden tree branch in my inventory. Then I realized that the enemies were entrenched in a slot canyon that was covered in grass. I decided to let nature do the dirty work, so I began my "controlled burn" of the moblin camp. It worked like a charm. 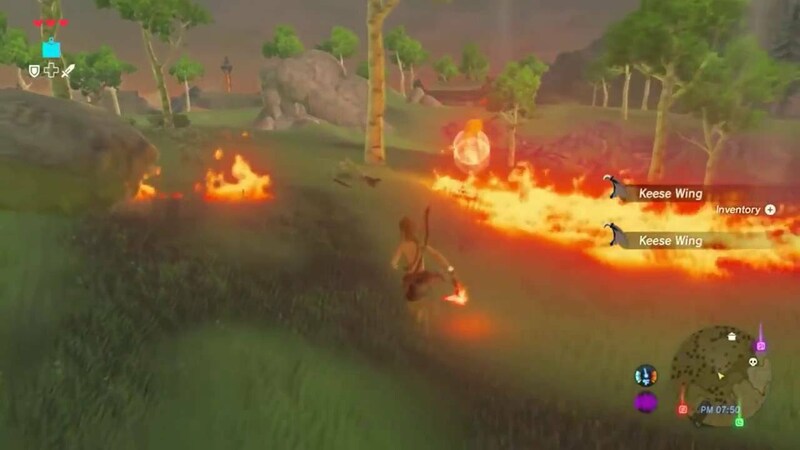 Within two minutes, the entire camp had been set ablaze during the dawn's early light and the bokoblins had been scorched. The camp was cleared and I didn't even fire a shot. Can you think of any game that lets you come up with that kind of solution? That sounds like end game content, but it was just this game being awesome in the first couple of hours. Throughout TLoZ: BotW you are faced with conundrums (not conundra, OED says so) that require careful thought and you can tell there are many ways to solve them, but which one will work or which one will work best? After the training area, you are armed with all the puzzle solving tools you will need. When I realized this, I have to admit, I was a bit disappointed. Zelda games have always had a massive list of items to collect that would help you gain access to new parts of the world. In that sense, I felt this game was becoming a bit more like Skyrim, until a couple nights ago when something dawned on me. This game doesn't tell you when you have an item designed for a specific use. The hammer you find is great at smashing ore. The duke leaf is great as a wind maker. The torch is used as a lantern. The woodcutter's axe, should be self-explanatory. They seemed all so ordinary, yet when used for a specific purpose, they have never been destroyed when used for their intended purpose, yet all can be used as melee weapons. Some things, like tree branches, will work in a pinch to thwack things with, but ultimately they're trash. While I have often felt that I have found the intended solution to particular puzzles, the game doesn't fault you for taking a "brute force" approach. Sometimes, I feel Dread Pirate Roberts Link, other times I feel like Ninja Assassin Link, and sometimes I feel like B. A. (Bad Attitude) Baracus Link. I pity the fools. . . When doing the shrine quests, which can be compared to mini dungeons, I never felt any game come as close to Portal as this one. While Portal and its sequel only required you to solve each of its chambers with the portal gun, and provided a gentle, and sometimes not so gentle twist (looking at you turrets), TLoZ: BotW typically adopts one theme into each of its trials. Some of them are combat trials, which crop up every now and then, but they are good practice for various forms of combat, and they reward you with sweet loot for killing those pesky hexapedal baddies. The puzzle-based trials were always fun, but sometimes beat my intellect during the wee hours of the morning. I never felt that the solutions were convoluted though. You just had to figure them out. To this point I have only discussed the way you approach the battles and puzzles. Even the way you explore the world is up to you. You can stick to trails and ride your horse directly to various points of interest, or you can run on foot. You can strike out in a random direction and explore, but what I find the most fun is mountain climbing. The sheer verticality of this game is insane. If it is a surface, you can (usually) climb it. In this way, it almost feels that the BotW is barrowing from the Assassin's Creed series. Especially when you consider that you climb many tall towers to activate the map of the area the tower is located in. While climbing isn't fast, it isn't boring. It almost always rewards you when you reach that area that is just barely eluding you. Whether there is a puzzle, treasure chest, or just a breathtaking vista to enjoy, the climb is always worth it, and then you can paraglide off of it to get to some new area. I could just frame some of these pictures. Luckily that guardian is dormant. Others are not. . .
Exploration is a joy, and the freedom this game provides is probably its greatest asset. Ask yourself, "Do I want to explore?" "Do I want to battle?" "Do I want to quest?" "Do I want to solve puzzles?" All of those choices have hours of options and they are readily available. I have never felt so invited by a game to explore just a little further, and I rarely found myself lacking a solution to conquer a new area. The only thing I might have been lacking was brain power as some of the puzzles are. . .puzzling. Each corner of this brave new Hyrule is enticing and requires you to adapt to the new landscape. Even the weather is forecasted for you and affects how you approach many aspects of the game. If it's sunny, just proceed as normal. If it's cloudy, things don't change too much but it can get hard to see afar off. When it rains, fires are extinguished and you can sneak much easier, but you can't climb sheer surfaces dependably. When lightning rolls in, well, it is some of the most polarizing moments you can have. If you have metal equipped, you can become the lightning rod and then immediately be sent back to your last save point. You better switch to non-metal items or you can place them near enemies and let nature do your fighting for you. I've even been attacked by enemies wielding metal items and I had to run during a lightning storm, because when they went down they were taking me with them. A game that actually incorporates a dynamic weather system that also changes how you approach the game is something I've never seen before. Maybe previous games have had weather effects in preset areas, but in this world weather was always a random variable I had to take into account. You even have to take into account how the environment changes in the day or night, but I'll let you discovers those nuances for yourself. The background music in this game is very subtle. Towns and dungeons have it, but only expect ambient piano flourishes to accompany your open world adventure. The game wants to highlight the sound of nature around you and it really absorbs you into the world. When the game does contribute an actual soundtrack, it is purposeful and very well done. The voice acting during key cutscenes is an appreciated effort from Nintendo, but they have a lot of learning to do from studios like Naughty Dog. The writing though for the text-based conversations is often witty and hilarious. One such moment came from a guy who doesn't accept rupees, but only his own minted currency. He says, "Mon is a currency I invented to destabilize the market and fight the establishment! Just kidding, there is no establishment in Hyrule. . ." I nearly died laughing. Yep, they made a joke about bitcoin in the new Zelda game. Wow! Sometimes the comments and conversations almost make you blush, but as this is an E 10+ rated game they don't go too far. The characters feel so alive and despite their cartoonish appearance, they often have more depth in their brief interactions with you or more extended side quests than many main protagonists in games these days. Nintendo introduces voice-acted cutscenes for the first time in series history. Not all players will see this. The story must be sought out. The story of BoTW is told mostly in flashbacks and the story in the present is formed more from what you bring to the game. 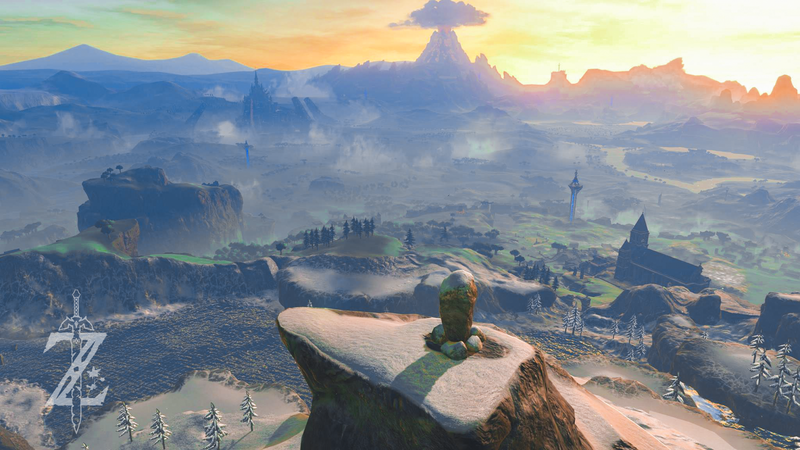 The flashbacks form a good foundation for why the world is in its calamitous state and they don't always follow the expected turns you have learned to expect from Zelda. That being said, the story is not this games strong suit, so don't expect a soulful tale like was had in Twilight Princess or Wind Waker. When searching for the memories that create the largest portion of the backstory I actually stumbled onto the final boss. Whoops, I was fighting Calamity Ganon, long before I expected to. Luckily, I was well equipped and trained already, so I won with a single heart left, and it was a thrilling battle that required a massive amount of help from the items I had crafted. Despite "beating" the game, I still have come back and enjoyed many more hours of this massive realm of Hyrule. There are still entire areas I have yet to explore and of the 900 Korok Seeds, 120 Shrines and 72 side quests, I have completed or found fewer than half. Nearly every type of gamer can find something to like. The game can be approached in a stealth style, or in a more aggressive approach. This game rewards battle skill as well as intelligent, passive planning. Sometimes it forces you into a specific type of encounter, but that isn't frequent. It is truly a marvel to behold. It's watercolor-style graphics perfectly complement the massive open world and hide well the lack of graphical horsepower that Nintendo systems are now unfortunately known for. I experienced the framerate hiccups that everyone reports, but they were only distracting on a couple occasions. Having played many hours of Elder Scrolls Online, I can definitively say that the framerate issues are far less frequent and severe in BotW than they are in ESO. This is where it all begins. This is your Hyrule to explore. Enjoy. I could go on for many more paragraphs, but the true conclusion to this review is this. Play it! It is well worth your while and you will love the hours you spend immersed in this beautiful creation. If you are contemplating getting a Switch or are a disgruntled Wii U owner, make sure this game makes it into your library. Presentation: 10/10-Understated and perfect. Pay attention when you first load the game. It is very unique. Absolutely immersive and what was needed for this entry in the series. Homage to all things Zelda and carries its own strong, very unique identity. Graphics: 9/10-Beautiful for their style, which covers the lack of horsepower well. Surprisingly gorgeous. Sounds: 10/10-Ambient sounds accompany you more than theme music, but when the music appears it is welcome and wonderful. Gameplay: 10/10-Controls are tight and responsive and allow for a huge variety of ways to play. Lasting Appeal: 10/10-I don't know how much larger a game can get without being an Elder Scrolls game. One playthrough to 100% completion may never happen without the use of a guide and will likely take well over 100 hours. Story: 7/10-The bulk of the story comes from flashbacks, but the parts that occur in the present offer nice resolution to the otherwise somber state of affairs that occurred 100 years ago, and that exist when you awaken. The focus isn't the story from the past, it is your own gameplay in the present making this more like an RPG than any other Zelda before it. Overall: (Not an average) 10/10. I have spent probably 30-50 hours playing this game and I still feel like I have accomplished a ton, yet barely scratched it's wonderful surface.